You can easily find praying mantis egg cases in weedy fields in the fall. (Or buy them online for about $10). We’ve done this the last two years and have some lessons. If you keep them inside, they will hatch early. Like in the winter. Those cute little plastic bug cases won’t hold the babies or nymphs. They can get through the holes. The first year I only discovered they mantises had hatched when I saw a mosquito-sized, strange looking bug on my dining room window. I spent days discreetly catching and releasing the dozens of mantises, trying not to alarm my husband, who is not as into this project as I am. The mantis eggs are in a center core of the case, surrounded by hardened foam. It’s like an airbag around the eggs. Don’t worry if the foam gets hurt. When the mantises hatch, they don’t start eating each other immediately. You should still release the tiny mantises soon or they will eat each other. If it’s too cold outside–or it is going to be–keep them alive with a fruit flies. Petco sells them by the jar in their disgusting-food-of-other-animals section by the reptiles. They will also need a wet sponge and your new fruit fly pets will also appreciate some rotting fruit. 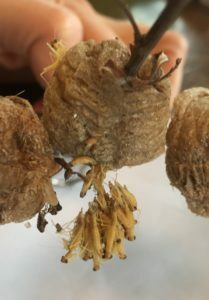 Tiny praying mantises pour out of the egg case.